(Photo by Lynn English) North Lamar offense lining up against Pottsboro Friday night. The North Lamar Panthers came in to Friday’s game as a 14 point underdog to the visiting Pottsboro Cardinals. For most of the night, North Lamar dominated the visitors on offense and defense. However, it wasn’t enough as Pottsboro walked away with a 14-11 victory. The Panthers dominated every statistical category. They finished the game with 21 first downs to only 10 for Pottsboro. North Lamar had 341 total yards of offense while their defense held the Cardinals to only 188. 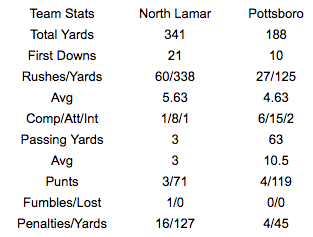 In the first quarter, North Lamar held Pottsboro to only four yards offense and only 44 in the first half. North Lamar struggled getting the ball in the endzone themselves. The only points they managed to get in the first half was a field goal by Travis Coston. This just wasn’t any field goal, though. After getting stopped on a third down and eight from the 29 yard line of Pottsboro, head coach Aaron Emeyabbi sent his senior out there for a 47 yard field goal. Coston had already made one from 40 this season. This time, he booted it through the uprights from 47 to give North Lamar a 3-0 lead. That would be the only scoring until the 5:35 mark of the third quarter. The North Lamar offense seemed to be rolling and was primed to take a 10 point lead. Jeremiah Guenther took a handoff from Jay Walters and took the ball up the middle 34 yards for a touchdown. However, a chop block penalty brought the ball back to the 49 yard line and negated the score. A few plays later, North Lamar was forced to punt. Once again the penalty bug bites as the Panthers were called for a illegal procedure. Not once but twice. On the third attempt, there was another flag but this one was for too many men in the huddle. On the fourth attempt, the snap sailed over Coston’s head and Pottsboro got the ball at the 23 yard line. Three plays later, Pottsboro punches the ball in for a score. It wasn’t until the fourth quarter that Pottsboro finally moved the ball on the Panthers. 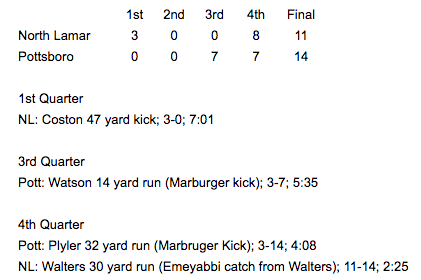 Of the 188 yards gained, 126 of that came in the final quarter. The first drive ended with a missed field goal. The second drive ended with a 32 yard touchdown run by Braden Plyler. Trailing by 11, the Panthers went to work as they got the ball back with just over four minutes to play in the game. North Lamar drove down the field in just under two minutes. It only took them six plays to get the 65 yards needed, capped off by a 30 yard run from Walters. Walters found Kobey Emeyabbi on the two-point conversion attempt. (Photo by Lynn English) Seybian Holt waiting for the next play against Pottsboro Friday night. With the score 14-11, North Lamar attempted the onside kick but could not recover it. Pottsboro, however, decided to throw the ball with the three point lead. Austin Allison was ready, too as he made his second interception of the ball game. North Lamar was unable to convert on the possession as they turned the ball over on downs to Pottsboro. With the loss, North Lamar goes to 1-3 on the season and will travel to Canton next Friday. Kickoff is at 7:30 and can be heard on Mix 107.7 beginning with the pregame at 7:00pm.